The 2018 medal for Allstate Hot Chocolate 15K finishers. The 2018 Allstate Hot Chocolate 5K/15K will take place Saturday, April 7 in Philadelphia. Across the finish line will be hot chocolate, of course, but also Finisher Mugs loaded with dark chocolate fondue and pretzels, Rice Krispies Treats, marshmallows and bananas for dipping. Runners don't have to wait to indulge, though. There will be sweets stations set up on MLK Drive with marshmallows, chocolate chips and M&Ms for participants to grab as they run past. There are more goodies for participants, too. 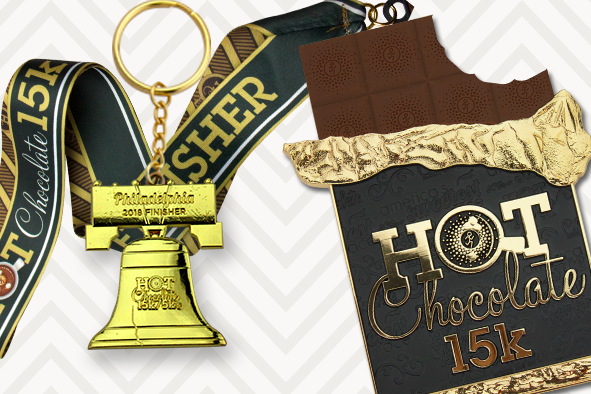 All runners will receive a fitted, long-sleeved quarter-zip jacket and 15K finishers will receive a chocolate bar-shaped medal. Registration is $51 for the 5K and $71 for the 15K. The price will increase after Sunday, March 4. Make-A-Wish is the 2018 charity partner.